The year 2018 saw perfect conditions for Serrated Tussock, allowing this weed of national significance to seed prolifically and contaminate stock feed. The Victorian Serrated Tussock Working Party (VSTWP) would like to advise landowners to ensure fodder and hay purchased this summer and autumn is free of noxious weeds, and in particular, serrated tussock (Nassella trichotoma). The previous year has seen perfect conditions for this weed of national significance to seed prolifically, resulting in many paddocks being infested prior to baling for fodder. Drier conditions also result in more fodder being transported around the state and interstate. Whilst it can be difficult to inspect all fodder purchased for noxious weeds, VSTWP Executive Officer Doug May suggests that ‘Landowners should attempt to purchase stockfeed from reputable outlets that can verify the absence of declared noxious weeds and from areas outside of the serrated tussock core infestations around the fringes of northern and western Melbourne’. ‘Landowners are often unaware of the grassy weed in their paddocks, especially during a decent spring like the one we just had and may bale paddocks unaware of the viable seeds in the fodder,’ noted Mr May. The VSTWP recommends that landowners set aside designated feed-out area, which allows the landowner to monitor this area regularly for the germination of weeds particularly after periods of rain. Landowners should keep an eye out for Serrated Tussock or any new or unusual plants in these feed-out areas and undertake control measures early before they flower and set seed. Long standing member and current chairperson of the VSTWP, John Burgess, stated that the VSTWP ‘advocates that best practice management is to control and treat mature serrated tussock plants prior to flowering and seeding each season with a registered herbicide, manual removal or cultivation’. 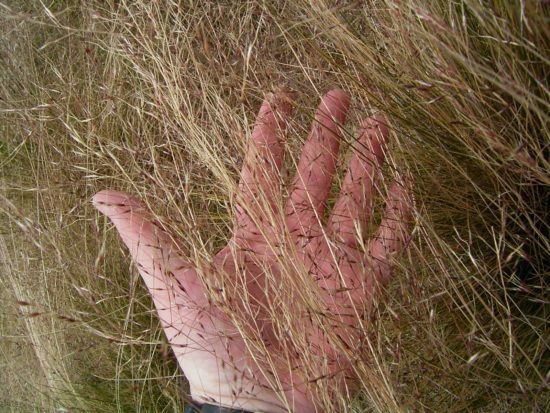 Serrated tussock is an introduced invasive plant from South America that has the potential to rapidly decrease the biodiversity of native grasslands and seriously reduce the agricultural capacity of properties. For further information, please visit www.serratedtussock.com or email info@serratedtussock.com. I live on a suburban block in wonderful Campbells Creek along Honeycomb Rd towards the bush walk path. On the verge, I am wanting to keep native grasses and dig out introduced weeds. I don’t have a good knowledge base yet but find removing weeds that I know Is so cathartic. Thanks this is very timely. We have found Serrated Tussock (Nassella trichotoma) on our property between Sandon and Yandoit. Last December, DELWP inspectors, god bless ’em, found 23 young plants, after finding three in 2015. We have never had this weed on the property and were most surprised when a few years ago, Connecting Country staff identified possible serrated tussock here – 2 plants! We were shocked, because this weed was not found in this area. Upon being identified by the botanist at Museum of Victoria, and with a staff member at DEWLP assisting us with identification, we have been able to check for plants every 6 months and remove them while young and before seeding. DELWP have continued to visit for monitoring and still better at identifying this weed than I. For me, the easiest way to identify is to role my fingers across the upright stem and check for ridging. If the ridges are present, it is serrated tussock! Interestingly the DELWP staff did a tracing of where all plants were found on our property and the plants were all emerging along a slight depression. When I traced this back historically to what had occurred on the property over the years, I could pinpoint what had caused the ridge. It was from machinery brought in by a contractor to deep rip the site in 1996, which was then a bald hill riddled with rabbit warrens! The line of emergent serrated tussock plants almost exactly followed the furrow of the machinery as it entered the paddock and traversed up the hill. Time to check that paddock again!